What's the Best Time of Day to Get Married at Pendrell Hall? What’s The Best Time of Day to Get Married? It's one of the most commonly asked questions and the answer depends on a number of different factors which we'll explore below but the short answer is somewhere between 12 noon and 2.30pm. Any earlier than 12 noon and your morning preparations can feel rushed, any later than 2.30pm and you might not have time to fit everything in. Time For The Magic To Happen! Your dedicated wedding day Events Manager knows exactly where you'd like all your personal items and decorations placed inside Pendrell Hall following detailed discussions with you prior to the big day and can orchestrate your unique venue setup that morning. Any suppliers are welcome from 10am on your wedding day and we'll work with them to ensure your perfect venue setup. Pendrell Hall is so beautifully designed and decorated that some couples add very little but if you plan to go all out with your venue decorations then the best time of day to get married would be anytime after 1pm to give your suppliers time to bring your vision to life. The Dressing Room at Pendrell Hall is all yours from 10.30am on your wedding day. It's a stunning and spacious suite with awesome mirrors and makeup stations; the perfect prep room for you and your bridesmaids. When considering the best time of day to get married at Pendrell Hall, think about how many gorgeous ladies need to get ready that morning! Have a chat with any professional hair and makeup suppliers you've booked and ask them how long they need. Make sure you factor in enough time to relax and have fun with your bridesmaids and don't forget to allow a few precious moments with your Dad before the ceremony. If you'd like your wedding photographer to capture some outrageously gorgeous shots of you and your loved ones having fun in the sun at your wedding then don't get married too late in the day! Think about when the sun sets in your wedding month and set your ceremony time for around two hours before sunset to guarantee some daylight for your wedding photographs. The grounds and mature landscaped gardens at Pendrell Hall are so beautiful that it would be a shame not to make use of them! 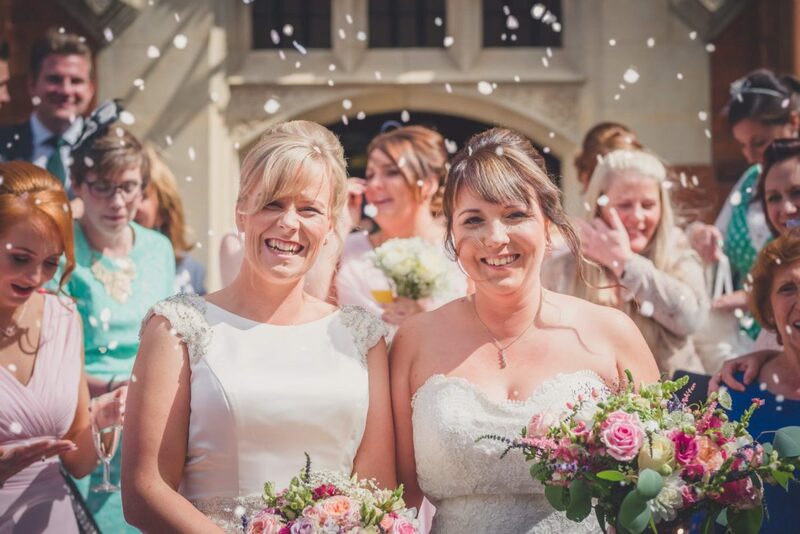 For the gorgeous Gemma &amp; Faye the best time to get married at Pendrell Hall was 1.30pm on a sunny August afternoon. Their day flowed beautifully and they's taken care to keep guests happy and entertained throughout the day with live music, a stunning wedding breakfast in The Ballroom and some great evening entertainment. Huge congratulations to them both, it was a beautiful wedding day captured exquisitely by their fabulous wedding photographers The Dignums. We'd really love to show you around Pendrell Hall so that you can see for yourself how wonderfully the venue lends itself to the flow of a wedding day. At the viewing we can discuss in detail what we think would be the best time of day to get married, depending on your unique wishes. After a viewing of Pendrell Hall we'll give you access to our Priority Information section of the website which features three detailed example wedding day timings based on 12 noon, 1.30pm and 3.00pm ceremony times. Every wedding at Pendrell Hall is different and we'll work to your perfect timings but it's really useful to know the impact your ceremony time has on the wedding day. Keep the kids happy at Weddings!